This is relatively easy to answer. There are all of the obvious reasons – they’re so pretty, they’re full of love and laughter, all those gorgeous details crying out to be captured. Who wouldn’t want to take photos of a wedding? But the main reason I want to photograph your wedding is to do with my own. 7 years ago I was preparing for our wedding. We were living, as we are now, in Finland and we were getting married back in the UK in the gorgeous city of York. It was all very exciting all of the ordering, all of the emails…it was a little sad too. I missed out on the excitement of trying on bridal gowns with my Mum or my friends, I didn’t get to tour around venues and taste wedding cakes but that was ok. We wanted to get married back home, we both had elderly and ill family members and so we were prepared to make the sacrifices necessary to make that happen. My dress came from eBay and our wedding cake was ordered from Marks and Spencer. None of those things really mattered. I loved the dress I found – it was champagne in colour and sooo pretty – did it really make any difference that it didn’t come from a boutique with a high price tag? Not to me. We had a rather limited budget and there were three things we knew we wanted to spend money on. The band, the honeymoon and the photographs. 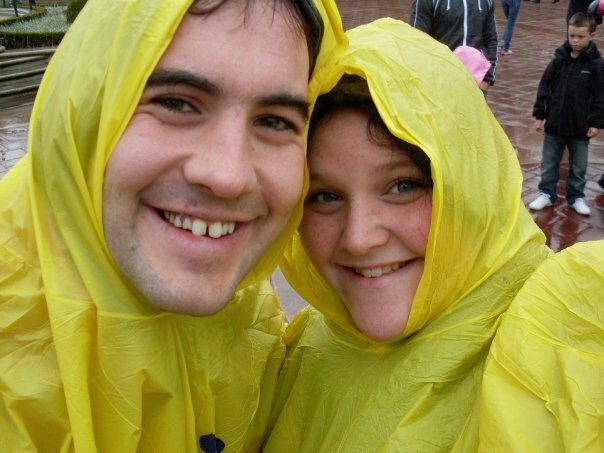 At Eurodisney…in the rain, and thrilled about it! The music was the next main concern. I wanted a band. And not just any band. I wanted a big band. 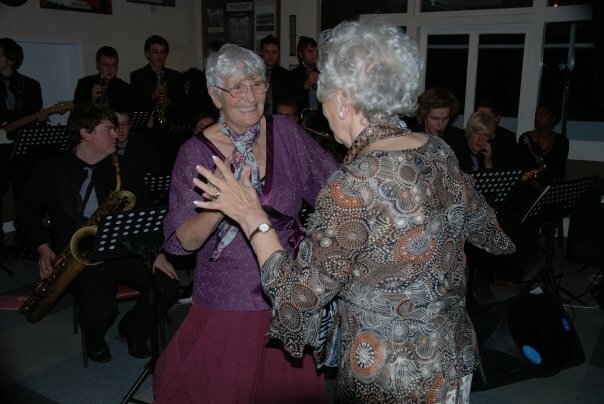 You know the kind, 1940’s style, Glenn Miller, big sound, catchy songs, singers with velvety voices that could croon you into a haze or entice you up onto the dance floor. I knew that such things were pricey – having sung with a band or two in my time I know for a fact how much it costs to pay every member of such a large band – but we struck gold in the Leeds University Dance Band. They were well worth every penny and even though they were so big they filled half of our little dance floor, they sounded amazing and they are one of the parts of the wedding that people still mention to me now! There wasn’t a song that didn’t have people up and dancing. 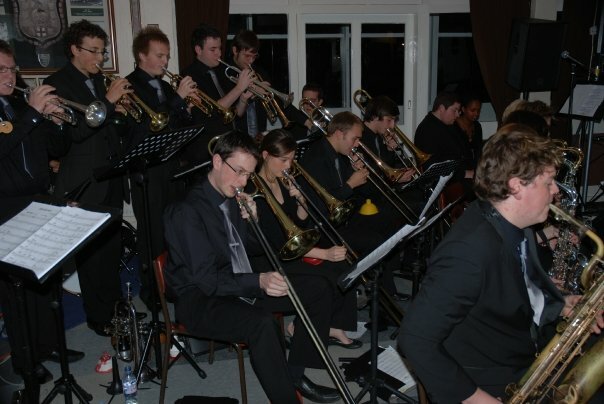 Leeds University Dance Band – amazingly good! And then came the photographer. As you already know by now, I do love my photos and so choosing a photographer wasn’t easy. We had our small budget and another slight issue. 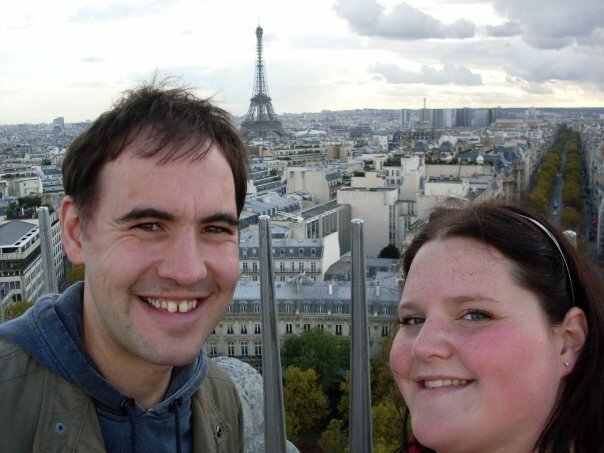 We were only going to be in the country for the week leading up to the wedding itself and then fly to Paris two days after. We wouldn’t be back in the UK until the following summer – we got married in October you see. Most photographers we found wanted to be able to show us all of our photos in their studio so we could revel in their beauty and then pick the ones we wanted. Sounds amazing but we just didn’t have the luxury of time. This was also 7 years ago and the idea of putting photos onto memory sticks just didn’t exist. So we needed a photographer willing and able to put our images onto a DVD for us. We searched and searched and we found the guy we hoped would be the one. His website was small but he told us he was in the process of upgrading it, his portfolio was limited but the photos we could see were great. We asked if he was free on our date and able to give us the photos the way we needed…. Another large chunk of our savings gone and a sense of calm fell upon us. All the big things were booked and we could relax – to a degree – and enjoy the run up to our wedding. The day of the wedding came and it was as eventful and memorable as I’m sure most weddings are. I was late, seriously late, after getting stuck in traffic. The coach supposed to pick up our guests and take them from the centre of York out to our reception venue…didn’t appear. My darling Grandma collapsed on the way from the ceremony and then my Mum spent a large period of the reception in A&E with her after she collapsed again during the party. Luckily members of the band were trainee doctors so she was in good hands until the ambulance came. (Don’t worry, there was nothing seriously wrong in the end but she’d not eaten very much but drunk plenty of pink champagne.) The balloon arch we’d spent hours making ourselves the day before, lasted all of two minutes into the speeches when someone’s chair snagged the wire and sent the whole lot up to the ceiling. All sorts of things happened that shouldn’t but that was just the way our day was supposed to be. Lots of amazing things happened too. The day was sunny and full of laughter and happy tears. My Dad, who has battled all sorts of illnesses over the last decade and more, was able to give me away. That in itself meant more to me than I’ll ever be able to put into words. Dear friends and family flew in from around the world. There were lots of hugs and I wouldn’t change a thing. Not a single thing. So the days and weeks after the wedding were spent anxiously awaiting the photos that would help us relive that amazingly emotional day. Eventually, after some chasing up, they came almost 2 months later. We giddily put the DVD into the computer and opened up the images. And they were very nice. There were a couple where you could tell someone who knew what they were doing had taken them but all those shots of our guests enjoying themselves, those moments we’d wanted capturing…were not there. The majority of our portrait shots were dark and, well, pretty shocking really. The shots of our reception and formal groups looked pretty similar to the photos our guests had sent to us in the mean time. Nice. Not what we had thought we had paid for, at all. At the time I smiled with my husband, I oohed and aahed and tried not to cry because I knew we’d made a mistake and there was no going back and making it better. Of the couple of hundred photos he sent us there are maybe 10 that are decent, well taken shots, and only two of our portrait shots were ever sent to the printers and hung up in our home. I actually checked his website not long ago…it’s exactly the same as it was all those years ago. I don’t think he’s in the business any more and that is a big relief to me. That at least no one is going to book him and believe that he’s more capable than he is. His limited gallery should have sent alarm bells ringing, the fact that there was nothing new added in all the months leading up to our wedding. I know, sadly, I’m not the only one who has had this experience, nor am I the only wedding photographer who was inspired and driven by this experience to want to make the brides and grooms of the future happier than we were. I don’t want anyone to feel the way we felt about our photos. I want to give you photos that you’ll treasure, that you’ll cry about for good reasons. I want to give you all those moments that will mean so much in years to come and I will, I promise. That is why I want to photograph your wedding and if you’d like me to, please do get in touch.